I love to bake breads – all kinds. Over these many years my breads have moved away from the traditional white bread and rolls I grew up with to incorporating whole grains, seed, husks and hulls of grains. 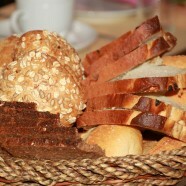 I typically think nutrition especially when I make breads or loaves. To promote healthier choices, the sweet taste in foods does not need to be sacrificed completely. Cut back on any white sugar in a recipe and whenever possible, add either, dried fruit or molasses, stevia, raw honey, maple syrup and dark brown sugar to sweeten and replace the recommended white sugar. In the case of a desert type loaf such as banana and nut or zucchini or muffins, I always add fresh and frozen fruit. Freezing these items is not a problem if they are carefully wrapped in plastic followed by aluminium foil. For bread and loaf recipes, consider adding dried currants, raisins, apricots or cranberries. These will add a zing of sweetness while lowering white sugar in the recipe. Baking recipes today are often grain or gluten free. Others will be vegetarian friendly – dairy and egg free. The following is a general guide to replace common baking items to complement specific dietary regimes. How to Replace the Sugar when using Fresh Bakers Yeast? If you are making yeast breads, a small amount of sugar is needed for the fresh yeast to rise. Typically 2 teaspoons of sugar is required to bakers yeast to rise. You may substitute the remaining sugars in recipe to accommodate your personal needs and taste. One six ounce cake of fresh yeast is equivalent to one package of dry yeast (2-1/4 teaspoons). Recipes calling for a liquid sugar are not interchangeable with granulated versions. For a healthy choice, try Agava syrup or use another form of sugar and adjust the liquids in the recipe. Honey and molasses are liquidly however the taste will be quite different depending on the recipe and for this reason may not be compatible. Restricted diets often require no corn products and the commonly used thickening agent, corn starch, needs to be substituted. Other choices include arrowroot, potato starch, tapioca, gluten free flour, guar gum, pectin and locust bean. Can Baking Soda Replace Baking Powder? Baking powder cannot be replaced with baking soda. For a truly grain free recipe replace baking powder with cream of tarter and baking soda. For example, to replace 3 teaspoons of baking powder which may contain wheat, cornstarch or rice starch, use 1.5 teaspoons of cream of tarter with just under, 1 teaspoon of baking soda or (sodium bicarbonate/bicarbonate of soda). Add one teaspoon of baking powder to a cup of hot water, not boiling. If you see a lot of fizzing action, the powder still has potency. If you notice the fizz dissipates quickly or not at all, your powder will not sustain the required rising for the recipe. Carrageenan and xanthan gum are food additives that are commonly used as a stabilizer, thickener, or emulsifier. Xanthan gum is popular in gluten-free baking for the elasticity it imparts to the dough. Items such as corn starch, arrowroot and potato starch have twice the thickening agent as flour, therefore use about half the amount called for first and then add a bit more if needed. Too much thickening compound can affect the end result of your dish. This is especially true when making sauces and gravies. When substituting butter, shortening or other oil in a recipe, only do so if a small amount is called for, otherwise, the texture, flavour is density of bake good will be altered unsatisfactorily. Butter substitution is one of the easiest to make; choose instead a dairy free margarine. Currently there are a number of alternative milk substitutes such as soy, rice, potato and oat milks. Nut derivative milks include almond, cashew and coconut. The ratio is one to one for replacing dairy milk with a non-dairy substitution. Caution should be employed when introducing tree nut milk products to anyone with a nut allergy. Evaporated milk contains sixty percent less water. Choose a milk substitute such as soy or rice and simmer until it has reduced by sixty percent. Be careful not to burn or scald the milk. Another alternative for evaporated milk is to substitute coconut milk 1:1 in the recipe; however, the recipe will have a slight coconut flavour. Not suited for all recipes. Simply add sugar to evaporated milk. Ratio: Mix 1 cup of evaporated milk with 1 ¼ cups of sugar and heat until the sugar is dissolved. Yield: 1 – 1/2 cups. Allow to cool. Fortunately today the choices are varied and many when seeking an alternative to wheat or other gluten containing grains and flour. These diverse flour choices are complied in order of popular choice, by supply and demand of product retailers. *Caution: Never consume raw legume flour without it first being cooked. Even a small amount (1 teaspoon) will cause pain, bloating and vomiting and diarrhea (especially if it were 2 teaspoons or 1 tablespoon. The symptoms can last all day as well. Cooked Bean/Legume Flour: I developed recipes for cooked legume flour and meal, due to the fact that I could not find any for purchase, including the internet. These can be found in my ‘Reverse Heart Disease Naturally’ book since it is a main component in the reversal process of clogged arteries and more.